The NASDAQ listed Rediff.com India Ltd has launched a group buying subsite called Deal Ho Jaye. It plans to offer deals in 70 categories to citizens in 40 cities and towns in India. Rediff.com is one of India's oldest Internet companies. It claims it has 15 million unique visitors per month and will be reaching out to this existing userbase with its deal alerts. "With the introduction of Deal Ho Jaye!, Rediff now offers local merchants and business owners options for reaching consumers beyond their traditional scope, building upon our e-commerce platform. Merchants can take advantage of Rediff.com's reach to generate business through new customers by offering special discounts and promotions on Rediff Deal Ho Jaye!," said Ajit Balakrishnan, Chairman and CEO. Rediff.com, in a media statement. The Deal Ho Jaye sub site offers between 30-60 per cent discounts on restaurants, spas, hotels, healthcare, tattoos, hobby classes, adventure sports and other local attractions. Currently they are only on services and not on products, unlike the trend that is sweeping through other deal sites. 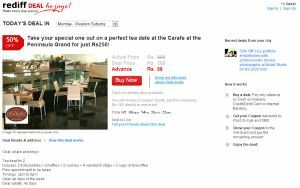 There are a host of e-commerce sites in the daily deals segment in India including Groupon India, eBay India, Snapdeal.com, Dealsandyou.com, Mydala.com, Koovs.com, Dailydeal.in, Dealivore.com, Khojguru.com, Thekha.com, Scoopstr.com, 24Hoursloot.com, Masthideals.com, Snatchdeals.com, Lootmore.com, 30Sunday.com and Bindasbargain.com. In our in-depth feature on e-commerce trends earlier, we had noted that shopping sites such as Indiatimes Shopping and Rediff Shopping need a total makeover. This news is proof that the change is happening. Sources say Indiatimes is also planning to foray into daily deals.